Sesquiterpene lactones are a class of bioactive plant products that display an array of biological and pharmacological activities such as antimicrobial, cytotoxic, anti-inflammatory, antiviral, antibacterial, and antifungal. A vast amount of sesquiterpene molecular structures has been reported, and the largest numbers of these types of compounds can be isolated from the Asteraceae (formerly known as Compositae) family. 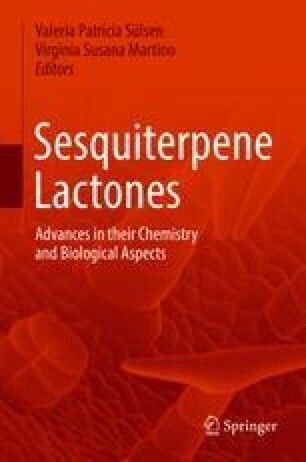 An important feature of these sesquiterpene lactones is the presence of an α-methylene-γ-lactone moiety which can react with nucleophilic sulfhydryl groups present in enzymes, proteins, and glutathione. The differences in the activities found among sesquiterpene lactones are due to the number of alkylating elements, lipophilicity, and chemical environment. This chapter discusses some of the synthetic pathways and summarizes the chemical transformation and biological activities of these sesquiterpene lactones.